There's a reason "an apple a day will keep the doctor away," is a cliche. Apples are one of the healthiest foods you can add to your diet and adding more of them to your diet, really could do your body some good. Not only do you have a variety of options (from tangy Granny Smith apples to sweet Fiji apples), they're an affordable option for a quick snack, smoothie ingredient or flavoring your water. There are plenty of ways you can add apples into your diet, from packing a small one as a snack at work to chopping them up in your oatmeal at breakfast. Another popular trick: apple detox water. With the gazillion of popular detox remedies on the market, it's hard to trust whether any of them actually work. The apple detox water relies on the benefits of apples and cinnamon to give your water extra flavor and your body extra health benefits. Apple cinnamon water could help get your metabolism going and encourage your body to burn more calories. Low in calories, you still get a boost of flavor from the added natural ingredients. Adding a little lemon could add some immunity boosting power too. Try drinking a glass before each meal to make yourself feel fuller and to help your body break down fats and sugars better, Happy Dieter recommends. Apples are a good source of fiber: While it doesn't rank at the top of the list for fiber content, it has a healthy supply and when combined with the other nutrients in the apple, your body gets the same benefits you'd expect form high fiber foods, like lower blood pressure and regulation of blood fat levels, according to World's Healthiest Foods. Apples help regulate blood sugar: Apples contain certain flavonoids which help breakdown complex carbs and regulate blood sugar levels, World's Healthiest Foods says. Apples help keep your teeth clean: Believe it or not, noshing on apples can help produce more saliva which reduces the risk of tooth decay, Best Health Magazine reports. Apples are good for the waistline: Best Health Magazine reports that foods high in fiber (like apples) will make it easier to skip the mindless snacking and help you feel fuller longer. Plus, apples and other fruits can help curb your craving for sweets. Apples protect against asthma: One study discovered that a diet filled with anti-oxidant rich foods (like apples and apple juice) can help relieve symptoms of asthma, according to Reader's Digest. Tip: Not to be forgotten, cinnamon packs quite a punch too. Medical News Today reports that cinnamon can treat cramps, sooth tummy troubles, curb appetite, lower blood sugar and help with erectile dysfunction. 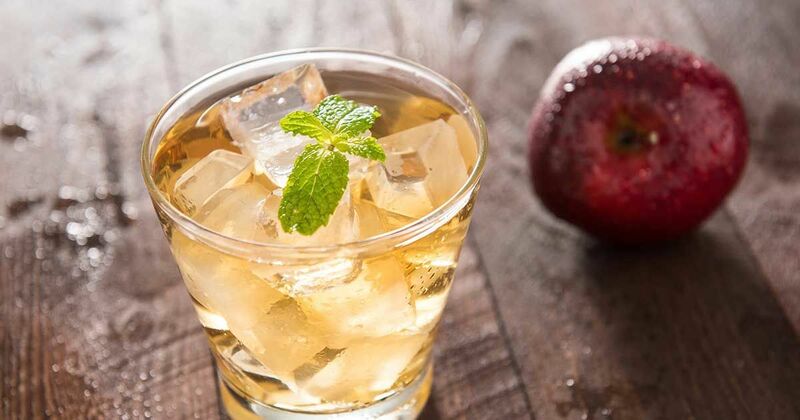 Simply chop up an apple or two and toss it into your favorite pitcher with a few sticks of cinnamon and let it soak for at least an hour, before pouring yourself a glass. Drink as often as you want, according to Detox Water Benefits. What are some ways you get your apple a day? Share your favorite ways to sneak in a healthy fruit in the comments below.